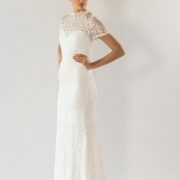 The Pippa is soft and elegant she is crafted from French solstiss lace. 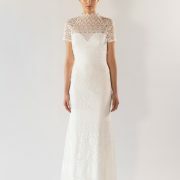 This stunning gown features a grown on neckline and raglan sleeve she has built in lining with signature lace placement. Pippa’s mermaid fitting skirt will accentuate the feminine body shape whilst her backless silhouette is traced with the same delicate lace which frames your back. 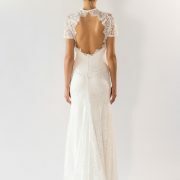 Add her graceful flowing train and you have the most classically elegant gown.